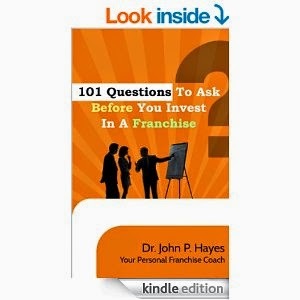 "101 Questions To Ask Before You Invest In A Franchise" is the must-have book for anyone looking to buy a franchise. The book opens by telling you that questions you THINK you should ask before buying a franchise are actually irrelevant. Then the author tells you exactly what you actually should ask. The book is organized as a series of checkpoints that you can move through during your decision-making process to evaluate franchise opportunities. One of the book's greatest assets is there are lots of facts and statistics. The book also, in addition to the information contained, has links to many helpful tools and more info online that can help with things such as finding franchise opportunities. A key point of the book is learning when to invest in a franchise. Other helpful topics covered are the break down of royalties and advertising fees and how to borrow money for a franchise. There really is a wealth of information in this book, and it is all presented in a format that is organized and easy to read. If you're considering investing in a franchise, you must check out this book.